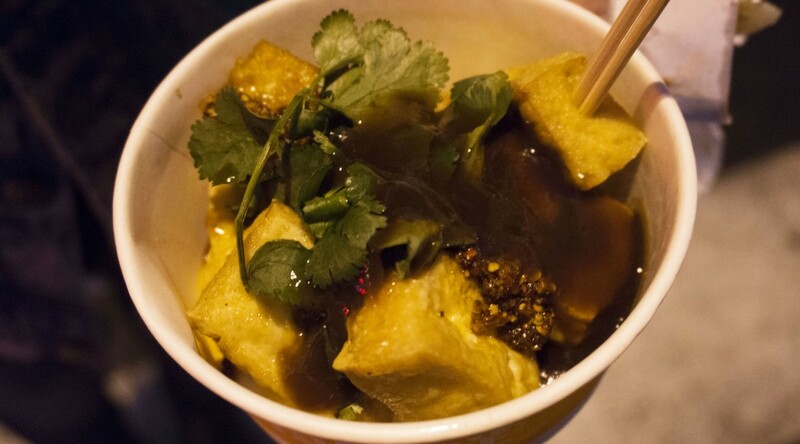 Chòu dòufu (Chinese: 臭豆腐 ) is a fermented tofu that is deep fried and topped with fermented bean paste sauce, cilantro and chili. Though its pungent smells may linger everywhere, those that can get past its strong scent can enjoy its soft, silky center. The street food snack is usually sold at night, served out of a small bowl and toothpicks to pierce each cube or served alongside rice congee as a breakfast meal. The tofu is left to ferment for weeks or months in a brine made from fermented milk, vegetables, and meat. Additional ingredients can be added into this brine, including dried shrimp, amaranth greens, mustard greens, bamboo shoots, and Chinese herbs. The tofu is left to ferment in a brine up to months. After the fermentation process, the tofu is cut into cubes and deep fried. Chou doufu is then topped with a fermented bean paste sauce, cilantro, and chili sauce. According to legends, chou doufu was invented by a man named Wang Zhi He during the Qing Dynasty. He studied to become a civil servant to emperor Kang Xi, but tried and failed many times. Every time he would leave his hometown to take the exam at the capital city, he would end up using all of his money for transportation and be left with nothing to purchase food. To save himself the cost and time, he decided to make a living in the capital city while he prepared for the next year’s exam. His family back home was wealthy from their tofu factory business, where he learned how to make it at a young age. He rented a few stores in the capital city and bought some simple tools to make it in order to sell it on the street. During that time, the summer heat was causing the fresh tofu that he didn’t sell to become moldy. He didn’t want to waste his food so he came up with a way to preserve it. He decided to cut the tofu into smaller pieces, sun-cure them, then pickle them with salt. They were left storing in a jar until autumn came and he remembered that he had left his pickling tofu. The moment he opened the jar, he was hit with the sharp stench of fermented tofu that had become grey and cinereous. He tried one and didn’t think its taste was terrible, so he sent them to the neighborhood who found that they, too, enjoyed the dish.